Home / News / What is a Frenectomy? You know what an appendectomy is, and a tonsillectomy, how about a frenectomy? Anthony M. Spina, DDS, MD: You know what an appendectomy is, and a tonsillectomy, how about a frenectomy? If it sounds like the removal or alteration of some type of tissue you’re on target. This video explains how a frenectomy may resolve certain conditions of the mouth that can lead to trouble. A frenum is a small fold of skin or membrane that connects parts of the oral cavity like the lips, cheeks, or tongue, to the more stationary jaw and gums. The frenum under your tongue is called the lingual frenum. When the lingual frenum is too large, it may impair the patient’s speech, and restrict the movement of the tongue. This condition is sometimes known as “tongue-tied.” The labial frenum is located between the two front teeth. It connects the upper lip to the maxilla or upper jaw. When the frenum is too large, it may interfere with the orthodontist’s ability to move the teeth into alignment. In some cases, an untreated labial frenum may lead to other problems, such as the absorption or dissolvement of the bone in this area of the mouth. Many times the orthodontist will refer the patient to the oral and maxillofacial surgeon for removal of the labial frenum. Katie Graber, DDS, MS: Where a frenum is left between teeth, it may be impossible to bring the teeth together. Sometimes the bone between these teeth may actually fail to form or dissolve away. The most common frenectomy recommended by an orthodontist involves removing the tissue between the upper two front teeth. The removal of the labial frenum may allow the closure of the gap between these teeth. In the lower jaw, the removal of an excess lingual frenum allows normal tongue mobility. If left untreated, restricted tongue function can cause adverse changes in tooth position, jaw development, and sometimes in speech. Patient: Before the surgery, I couldn’t really move my tongue very well, and the piece of skin under my tongue was pulling too tight on it. 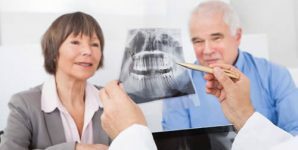 Anthony M. Spina, DDS, MD: When the orthodontal patient comes to the oral and maxillofacial surgeon office for a consultation before a frenectomy procedure, the surgeon takes a history, conducts a physical examination, and reviews any pertinent radiographs. The procedure is explained, and an appointment for the surgery is scheduled. For surgery, it is very important that the mouth be clean. We ask patients to brush and floss their teeth as usual. Sedation may be required, especially for young children, so ask your surgeon about restrictions on eating and drinking before surgery. Finally, it’s best to go to surgery wearing loose and comfortable clothing. Patient: The cut away the skin, a little bit of the skin, underneath my tongue, that was pulling it back. It worked out very well. Now I can move my tongue a lot more, and I can get pieces of food that might get stuck in my teeth. Katie Graber, DDS, MS: The prime outcome is a balanced environment for the developing teeth and jaws. This balanced, soft-tissue environment supports not only the establishment of proper tooth and jaw position during treatment, but helps us maintain these changes long term.